Scratch Pro® for Sinks is a revolutionary scratch repair and polishing kit for stainless steel sinks. It is the only product on the market containing diamond buffing compounds that reduce the appearance of scratches and polish your stainless steel sink to look like new. Each kit includes: 5 pcs of Scratch Pro Sandpaper, 2 color-coded diamond buffing compounds, #2 Orange and #3 Black, and corresponding buffing pads, and a foam gripper for easy buffing by hand. Important: Buffing with step #1 / ScratchPro Sandpaper will likely produce a lighter silver finish on your stainless steel surface. It is recommended to go over the entire surface in order to ensure a consistent finish and seamless blend. If you have no scratches to remove and simply want to restore the shine to your sink, you can skip step #1. Read the kit instructions before use. With only three steps needed, your sink may look factory-fresh in practically no time! Ideal for use by both home owners and professional contractors. A Revolutionary Repair and Cleaning Kit with Diamond Buffing Compounds for Stainless Steel Sinks that eliminates scratches in minutes and polishes your stainless steel sink to look like new! 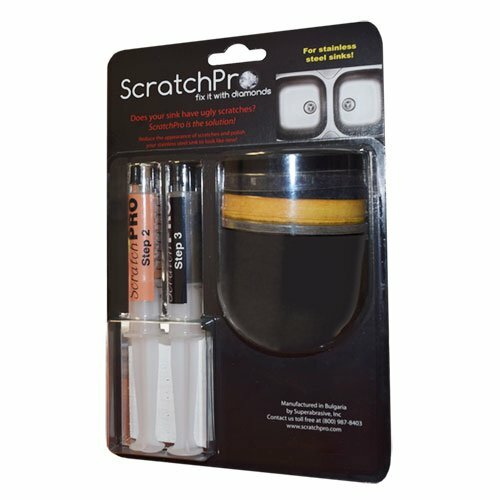 Quick and Easy 3-step Scratch Repair Process: Step 1 - Scratch Pro Sandpaper; Step 2 - Orange Scratch Pro Buffing compound; Step 3 - Black Scratch Pro Polishing compound. No experience, no professional tools required! Ideal for use by both home owners and professional sink installers and contractors. If you have any questions about this product by Scratch Pro, contact us by completing and submitting the form below. If you are looking for a specif part number, please include it with your message.